November finds me still working on winterizing my hives. They all survived mid-month lows in the 20’s in spite of my neglect, but it’s time to get them squared away. I ran short on the towel boxes and screens I use to deal with condensation above the brood chamber, so I spent the morning with a hammer in my hand. My normal set-up includes a hive-body-sized screen to keep the towel away from the opening in the inner cover (see last November’s post for my full fall ritual). Inspired by John Edward’s article in the OSBA’s Beeline newsletter about Ruhl Bee Supply’s Vivaldi board, I built much smaller screens to do this job. This screen sits inside the towel box atop the inner cover and will allow me to tuck feed and other supplements into the opening without disturbing the winter hive wrap. 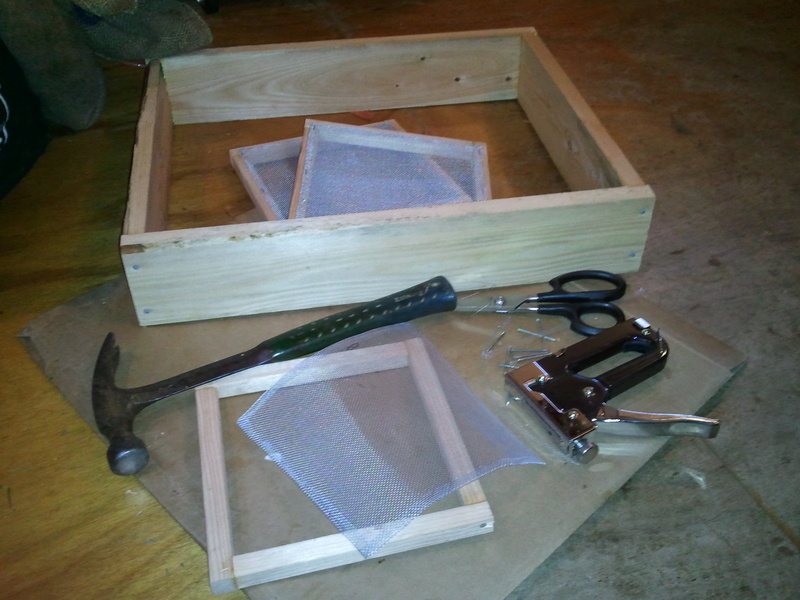 My full-sized screen arrangement requires that I disassemble the winter hive wrap in order to feed light hives. This should be a big improvement! Good job Kelly! I like it!